The town of about 12,000 -- best known before now as the original headquarters of the Ringling Brothers and their circus -- quickly felt the sting of national, and even international, embarrassment. The Auschwitz-Birkenau Memorial and Museum tweeted its outrage and attached a link to history lessons about Nazi Germany. This was followed by everyone insisting this photo isn't representative of the local population, as well as school officials promising to investigate. The photographer, Pete Gust, who had a son in the picture, told news outlets: "There was no Nazi salute. The last picture we had done ... I'd said to them, 'OK, boys. You're going to say goodbye to your parents, so wave.'" Why did everyone in the national media rush to assume the worst and end up with "fake news"? There's an easy guess. The Associated Press quickly found Baraboo's state senator, Jon Erpenbach, who blamed ... the rhetoric of President Trump. He said: "There's no room in the world for anything like that at all. From what they're seeing out of the White House, that it's OK to be intolerant and racist." In today's America, the "objective" press is looking for racist neo-Nazis under every rock who don't submit to the will of The Resistance. But these same outlets refuse to condemn the ongoing attachment of leftists and Democrats to the anti-Semitic Minister Louis Farrakhan, whether the politicians photographed with him are Reps. Maxine Waters or Keith Ellison, or even former President Barack Obama. The scandal -- among some of the most powerful adults in the land -- is barely even recognized. CBS "This Morning" offered one brief anchor-read story earlier this year when an old photo of Obama smiling with Farrakhan surfaced after being suppressed for years. ABC and NBC slept on it. None of these networks were outraged in September when Farrakhan sat on a dais of honorees during the blanket coverage of Aretha Franklin's funeral, right next to Rev. Al Sharpton, Rev. Jesse Jackson and former President Bill Clinton. 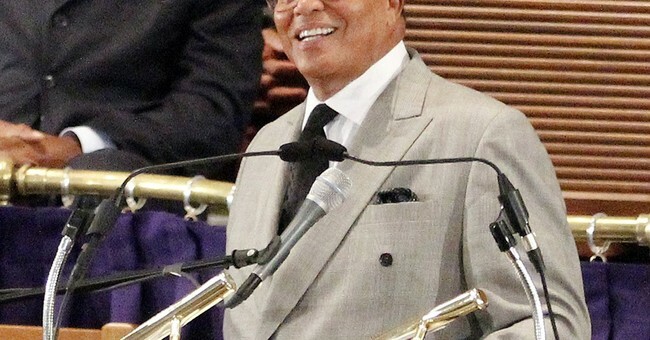 Three days later, CBS and NBC reported there was "controversy," but they utterly skipped Farrakhan. Whoopi Goldberg on ABC's "The View" told everyone to back off. "It's not about Bill Clinton or Louis Farrakhan. It was all about Aretha," she ranted. "That's why everybody just needs to pull back. Just pull it back, you know, and understand that this is -- we don't control everything." On the same night all three networks were covering supposedly hateful Baraboo High School prom pictures, only ABC covered Hamas terrorists lobbing missiles into Israel from the Gaza strip to murder Jewish people. National "news" judgment is a pernicious thing.